A unit of media data that has a presentation timestamp and decode timestamp. The presentation timestamp indicates when the frame should be rendered. The decode timestamp indicates when the frame needs to be decoded. If frames can be decoded out of order, then the decode timestamp must be present in the bytestream. If frames cannot be decoded out of order and a decode timestamp is not present in the bytestream, then the decode timestamp is equal to the presentation timestamp. A sequence of coded frames that are adjacent and monotonically increasing in decode time without any gaps. Discontinuities detected by the coded frame processing algorithm and abort() calls trigger the start of a new coded frame sequence. Notify the media element that it now has all of the media data. Playback should continue until all the media passed in via appendBuffer() and appendStream() has been played. Queue a task to fire a simple event named removetrack at the HTMLMediaElement audioTracks list. Queue a task to fire a simple event named removetrack at the SourceBuffer audioTracks list. Queue a task to fire a simple event named removetrack at the HTMLMediaElement videoTracks list. Queue a task to fire a simple event named removetrack at the SourceBuffer videoTracks list. Queue a task to fire a simple event named removetrack at the HTMLMediaElement textTracks list. Queue a task to fire a simple event named removetrack at the SourceBuffer textTracks list. The timestamps in the media segment determine where the coded frames are placed in the presentation. 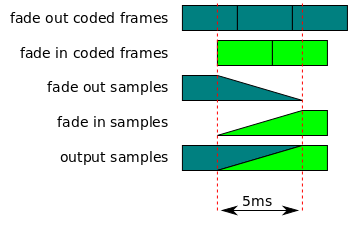 Coded frames within a media segment must be adjacent in time, but media segments can be appended in any order. Media segments will be treated as adjacent in time independent of the timestamps in the media segment. Coded frames in a new media segment will be placed immediately after the coded frames in the previous media segment. The timestampOffset attribute will be updated if a new offset is need to make the new media segments adjacent to the previous media segment. Setting the timestampOffset attribute in "sequence" mode allows a media segment to be placed at a specific position in the timeline without any knowledge of the timestamps in the media segment. If the new mode equals "sequence", then set the sequence start timestamp to the highest presentation end timestamp. If the mode attribute equals "sequence", then set the sequence start timestamp to new timestamp offset. Indicates whether an appendBuffer(), appendStream(), or remove() operation is still being processed. This attribute is initially set to false when the object is created. Abort the segment parser loop, buffer append , and stream append loop algorithms if they are running. Appends the segment data in an ArrayBufferView to the source buffer. This is the signal that the implementation was unable to evict enough data to accomodate the append or the append is too big. The web application must use remove() to explicitly free up space and/or reduce the size of the append. Each track buffer has a last decode timestamp variable that stores the decode timestamp of the last coded frame appended in the current coded frame sequence. The variable is initially unset to indicate that no coded frames have been appended yet. Each track buffer has a last frame duration variable that stores the frame duration of the last coded frame appended in the current coded frame sequence. The variable is initially unset to indicate that no coded frames have been appended yet. Each track buffer has a highest presentation timestamp variable that stores the highest presentation timestamp encountered in a coded frame appended in the current coded frame sequence. The variable is initially unset to indicate that no coded frames have been appended yet. The sequence start timestamp variable keeps track of the starting timestamp for a new coded frame sequence in the "sequence" mode. It is use to handle discontinuities, placing media segments adjacent to "segments" mode appends, and placing media segments in the presentation via timestampOffset. It is unset when the SourceBuffer object is created and gets updated when the mode attribute equals "sequence" and the timestampOffset attribute is set, or the coded frame processing algorithm runs. The highest presentation end timestamp variable stores the highest presentation end timestamp encountered in the current coded frame sequence. It is set to 0 when the SourceBuffer object is created and gets updated by the coded frame processing algorithm. If the input buffer starts with bytes that violate the byte stream format specifications, then call endOfStream("decode") and abort this algorithm. If the first initialization segment flag is false, then call endOfStream("decode") and abort this algorithm. 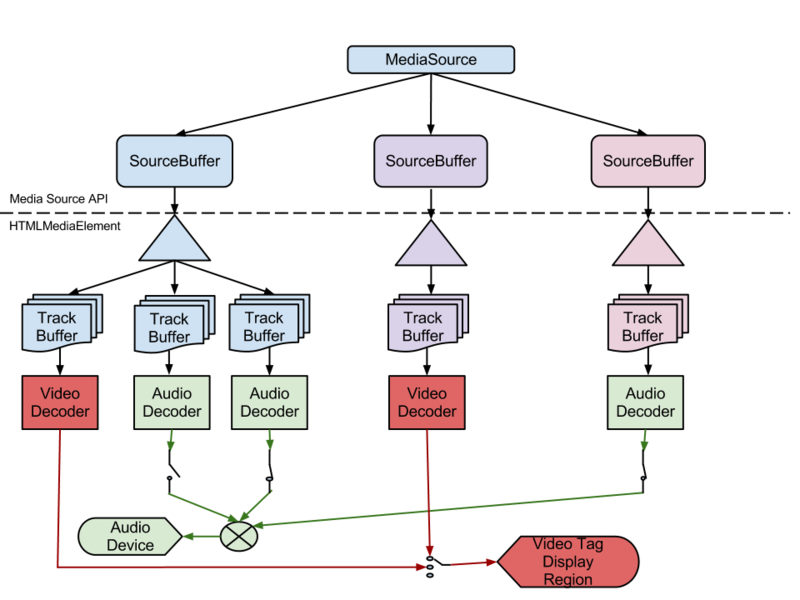 Queue a task to fire a simple event named addtrack at the AudioTrackList object referenced by the audioTracks attribute on this SourceBuffer object. Queue a task to fire a simple event named addtrack at the AudioTrackList object referenced by the audioTracks attribute on the HTMLMediaElement. Queue a task to fire a simple event named addtrack at the VideoTrackList object referenced by the videoTracks attribute on this SourceBuffer object. Queue a task to fire a simple event named addtrack at the VideoTrackList object referenced by the videoTracks attribute on the HTMLMediaElement. Queue a task to fire a simple event named addtrack at the TextTrackList object referenced by the textTracks attribute on the HTMLMediaElement. Let discontinuity flag equal false. Set timestampOffset equal to sequence start timestamp - presentation timestamp. Set highest presentation end timestamp equal to sequence start timestamp. Set the discontinuity flag to true. Set sequence start timestamp equal to the highest presentation end timestamp. If track buffer contains video coded frames and the presentation timestamp is less than the remove window timestamp, then remove overlapped frame and any coded frames that depend on it from track buffer. Implementations may use different methods for selecting removal ranges so web applications must not depend on a specific behavior. The web application can use the buffered attribute to observe whether portions of the buffered data have been evicted. This section specifies new attributes and internal state that are being added to the HTMLMediaElement. Each HTMLMediaElement will maintain a total video frame count variable that keeps track of the total number of frames that have been displayed and dropped. This variable is initialized to 0 when the element is created and whenever the media element load algorithm is invoked. It is incremented when a video frame is displayed or when the dropped video frame count is incremented. Each HTMLMediaElement will maintain a dropped video frame count variable that keeps track of the total number of frames that have been dropped. This variable is initialized to 0 when the element is created and whenever the media element load algorithm is invoked. It is incremented when a video frame is dropped predecode or when a frame is decoded but dropped because it missed a display deadline. Let playbackQuality be a new instance of MediaPlaybackQuality. All timestamps must be mapped to the same media timeline.